Cucumbers have long been regarded for their health benefits outside the diet. 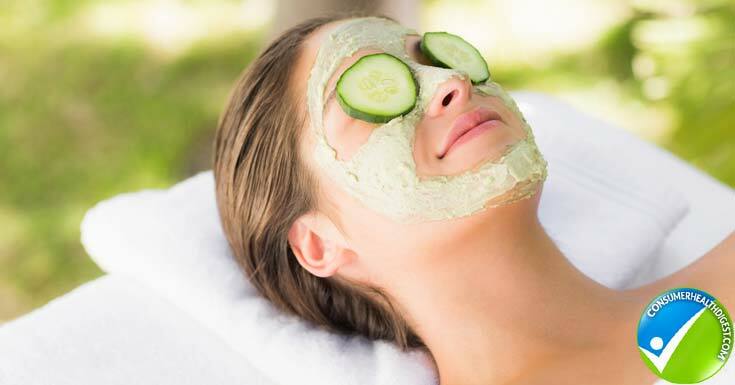 Most of us can remember the image of a woman with cucumbers on her eyes, perhaps a mask covering the rest of her face. Most likely a ‘cucumber’ mask at that. Cucumbers ARE cool, to the touch and as it is an inanimate object, it surely cannot be composed, but rather – temperate, in the analogous context. They are so awesome for so many reasons. Cucumbers belong to the same family as melons and squashes (or gourds). Cousins of this fruit include watermelon, cantaloupe, summer squash, zucchini and pumpkin. They are delicious and nutritious! Not to mention the several other benefits this surprisingly well known fruit is not well known for. Now, as you recall to mind the image of the woman with the cucumbers on her face, try to pull together everything that you know about cucumbers. Beyond that, prepare to have your mind blown. Let us begin with skin and hair care while it’s on the agenda. 1. Cucumber may do more for your skin than for your palate. Cucumbers are a source of several compounds that fight inflammation and skin aging. Among these compounds are cucurbitacins and cucumerin. 2. Take note that cucurbitacins could be a promising target for cancer therapy! It is stated in the International Journal of Health Sciences that natural and semi-synthetic cucurbitaceous show promising anticancer activities. We’re barely touching the surface here. 3. In an article published in 2007 in the medical journal ‘Advances in Experimental Medicine and Biology’, it was stated that cucumerin has potent anti-inflammatory and anti-tumor properties. It is further stated that cucumerin regulates chemical messengers that cause inflammation in the body. So, keeping up with the skin benefits alone – these anti-inflammatory properties aid in skin health alongside the antioxidants and other vitamins that are multi-functioning in this quiet super-food. 4. Vitamin K – Which is also an antioxidant helps fight dark circles under the eyes. 7 In a study published in the ‘Archives of Dermatological Research’, it was concluded that the presence of ascorbic acid (Vitamin C), makes cucumber juice an effective ingredient for anti-wrinkle products. As a precursor to collagen, cucumbers are a source of silica, which can help fight wrinkles. Cucurbitacins and Cucumerin are only two major compounds found in cucumbers. It is important to mention lignans as well, especially while anti-cancer activity is in the mix. Lignans are are a group of chemical compounds found in several types of plants. There are three specific lignans that have been connected to the reduced risk of several types of cancers. SecoisolariciresinolDiglycoside (SDG) is full of anti-oxidants and various studies have provided evidence that a supplement that contains SDG can assist with reducing serum levels. Low-Density Lipoproteins – also known as “bad” cholesterol. These lipoproteins is also usually associated with low blood pressure levels. According to wisegeek.com, this substance can also help reduce the risk of developing diabetes. 8. 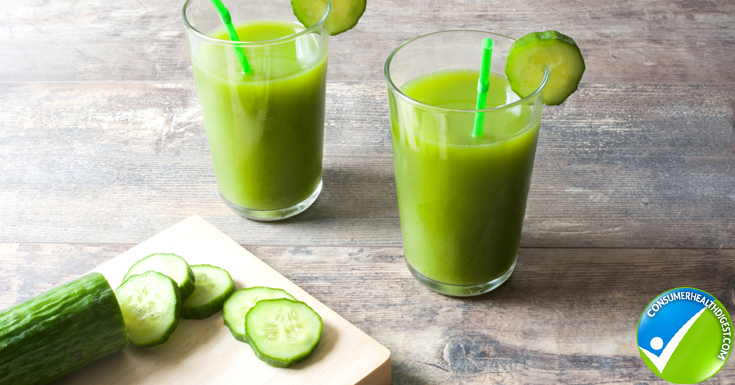 Diabetic patients may benefit from drinking cucumber juice because it contains a hormone needed by the cells of the pancreas to produce insulin. 9. 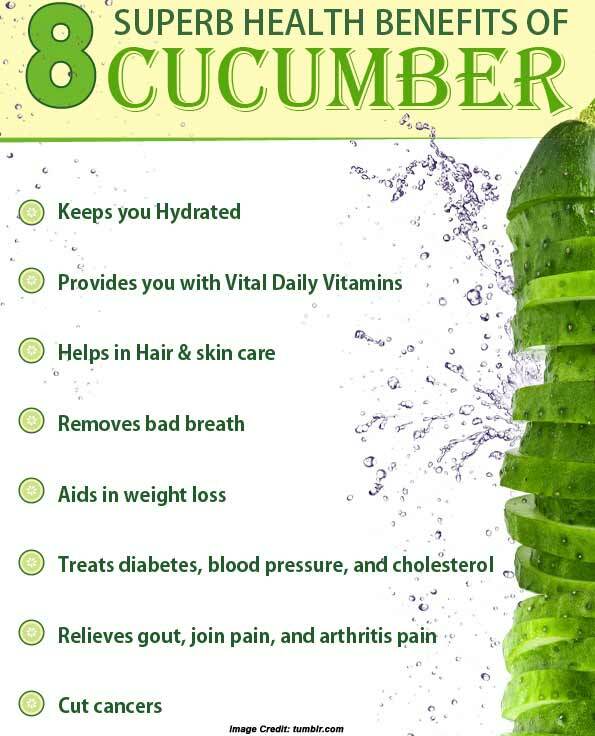 Cucumbers are a non-starchy fruit with few carbohydrates, high in water content and a good source of fiber. For this reason, they may play a role in blood sugar maintenance. 10. According to livestrong.com, The University of Illinois Extension suggests eating 20 grams of fiber for every one thousand calories to lower blood sugar. It is further stated that a one cup serving of cucumbers provides a half a gram of dietary fiber with only 16 calories, essentially increasing your fiber intake without significantly boosting your calorie intake. 11. As cucurbitacins and lignans and cucumerins have been mentioned, we must not forget the importance of flavonoids. These are all phytonutrients found in cucumbers that are being researched for their valuable antioxidant, anti-inflammatory and anti-cancer benefits. Flavonoids are reported to be part of plant metabolites. These compounds are reported to provide numerous health benefits thanks to their antioxidant properties, as well as through signaling cell pathways. Quercetin – most frequently studied for its potential health benefits. It is similar to vitamin C and many other compounds offering anti-inflammatory effects. It has also been noted to help prevent or treat heart disease, diabetes, hypertension, allergic reactions, asthma, arthritis, cancer and prostate problems. Furthermore, it is stated to improve athletic performance, bone health and the immune response, prevent fatigue, reduce recovery time and boost energy! Wow – that’s a whole lot of benefits stuffed into one little antioxidant! Apigenin – This is a natural phytochemical. It may block the formation of uric acid, leading to beneficial effects in gout. It has been noted that there could be anti-depressant like effects within apigenin found in some plants. According to Heart Health Guide, this particular flavonoid is associated with reduced risk of heart problems, neurological conditions and several types of cancer. Luteolin – A 2010 study published in the Journal of Nutrition reported that luteolin is known as a flavonoid. Evidence was provided that this flavonoid can reduce levels of inflammation in the brain. The study was conducted on a group of aged mice. Further evidence was provided of memory levels restored to that of younger animals. The original study recorded findings of luteolin’s effect on immune cells found within the brain. The immune cells targeted are responsible for producing inflammatory signals in response to an infection. This specific study was also the first to provide evidence that luteolin can be associated with improvements in cognitive function. Kaempferol – while more studies are needed, it has been found through the investigation of the neuroprotective effects of kaempferol in the mouse model of Parkinson’s disease that kaempferol could prevent the loss of TH-positive neurons induced by MPTP. Scientists propose that kaempferols has shown anti-Parkinson properties throughout their studies. 12. Rumor has it that cucumbers could be good for your hangover… Reports claim that B vitamins, electrolytes and sugars contained within cucumbers can assist with replenishing different nutrients that are essential to the body. They also report that this effect can treat the hangover, as well as the headache that accompanies the hangover. 13. Consider what they must do for our system in the cleansing process. They can keep your body hydrated while at the same time eliminating toxins. It is stated that cucumbers have most of the vitamins the body needs in a single day. 14. Think of this too – cucumbers are, again, high in water content, but low in calories. This makes it an ideal snack for those that are looking to lose weight. Reports claim that eating cucumber on a daily basis can also be an effective remedy to relief chronic constipation. 15. According to World’s Healthiest Foods, “two common questions about cucumbers involve consumption of their skin and their seeds.” It is important to know that the skins and seeds of cucumbers are rich in nutrients and therefore, from a nutritional standpoint, it is recommended to consume the skin, meat and seeds of the cucumber. 16. Don’t like cucumbers? Try some pickles. Pickling is a method for preserving food to prevent spoiling. 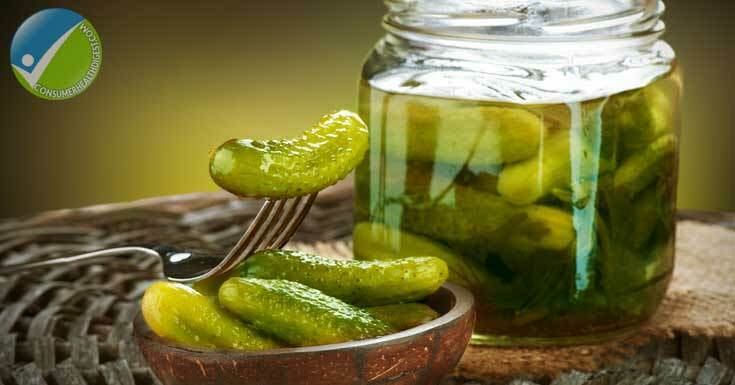 According to World’s Healthiest Foods, there are two types of pickles, fermented and non-fermented, however the main ingredient in the pickling process has to do with vinegar. 17. Vinegar has elemental health benefits in itself. It has antimicrobial properties and antioxidant effects. With all that has been discussed herein, it’s no wonder that cucumbers are considered one of the World’s Healthiest Super-Foods. Remember that cucumbers found in the store may have been sprayed with pesticides… it is recommended to buy organic or grow your own. Should you have no other option but to buy regular (non-organic) cucumbers, be sure to rinse them well in water before consuming or using them on your skin.